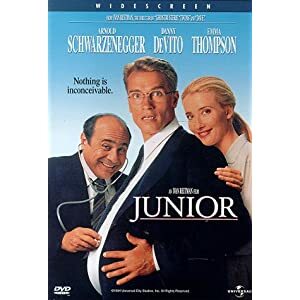 In Junior, Arnold Schwarzenegger is Dr. Alex Hesse, who is working with another doctor (Danny Devito) on a drug to make pregnancies go more smoothly. When their research project loses funding, they decide to use an egg and implant it inside Alex. Schwarzenegger is hilarious as a pregnant man, and some of the dialog makes this film outrageously funny. Of course, Devito is great as usual. And Emma Thompson, who plays a fellow researcher, is cast perfectly for her role. If you're looking for a funny comedy movie, this one makes a great gift for guys of all kinds.